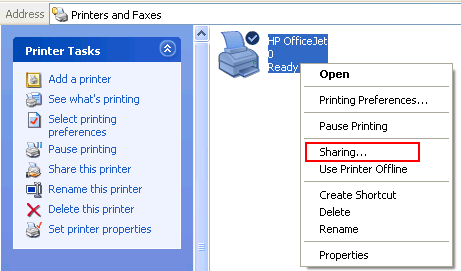 To share printer in Windows XP is similar to when sharing a folder. You have two ways to share you printer. 1.) 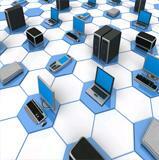 You can use the Network Setup Wizard to automatically turn file and printer sharing on and off. 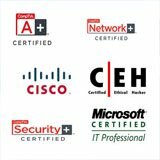 This works only if your computer is not joined to a domain. The Control Panel window opens, now double-click Network Setup Wizard. 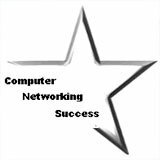 Follow the instructions in the Network Setup Wizard and it will allow you to configure a new computer name, configure the workgroup name and it will enable file and printer sharing for you. 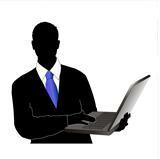 The Windows Firewall will also be configured to allow file and printer sharing on your network for you. 1.) 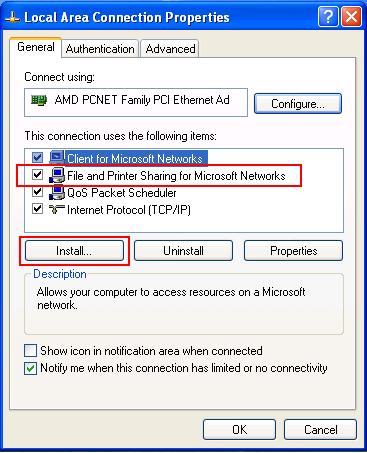 First let's make sure that File and Printer Sharing for Microsoft Networks is installed on your network adapters. The Local Area Connection Properties window opens. 2.) 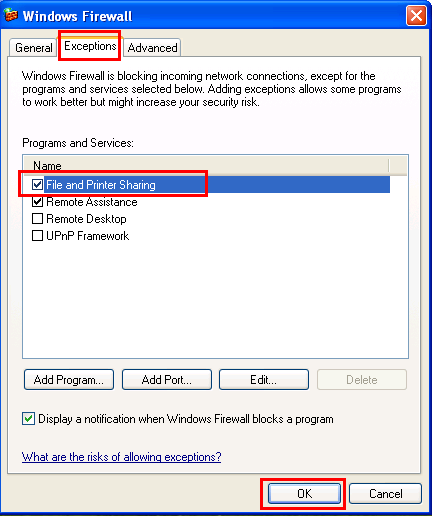 Next, let's make sure that Windows Firewall allows File and Printer Sharing on your computer. 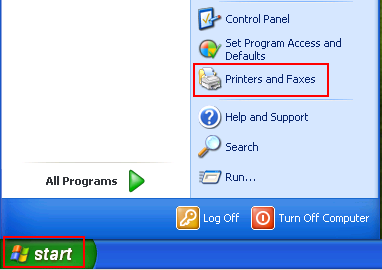 Select the Exceptions tab and select the File and Printer Sharing check box to enable it. Click OK.
Now let's share your printer! 4.) The Printer and Faxes window opens. 5.) Select the Sharing tab and click Share this printer. Next to Share name: type in the name of the print share that you want your printer to show when another computer sees the printer on the network. This name will not change the original name of the printer. I named my print share "HPOffice". 6.) 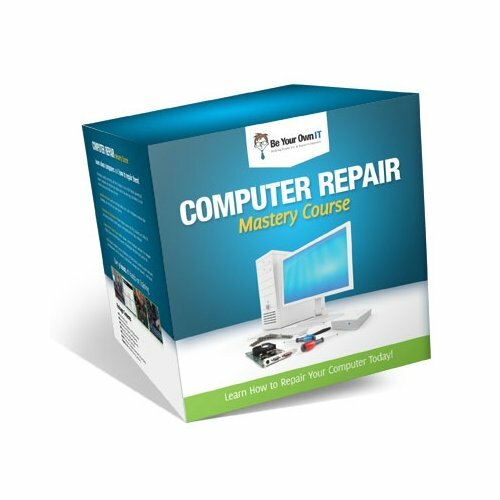 If you click Additional Drivers you will be able to install extra print drivers for other operating systems that are running on your network. 7.) 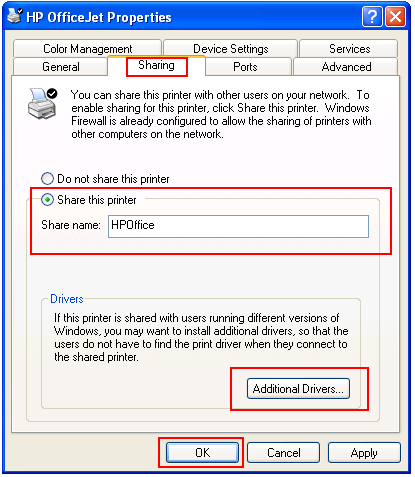 In the Additional Drivers window, choose the other operating systems of your other computers on your network which will connect to this printer. 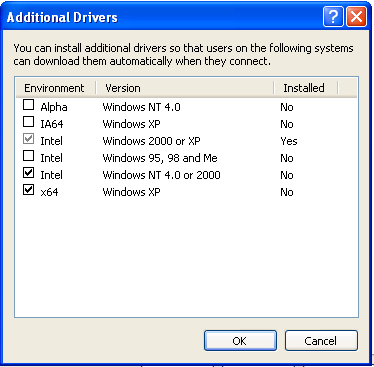 When you click OK, you will be prompted to install the drivers. When one of these computers connect to the share of your printer, then the computer will be provided with the correct driver. This is how you can tell if your printer was shared correctly.